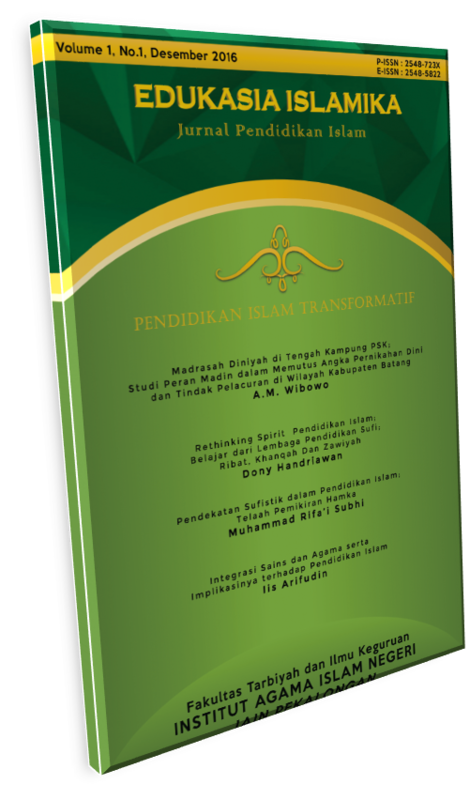 Edukasia Islamika: Jurnal Pendidikan Islam (ISSN: 2548-723X and E-ISSN: 2548-5822) is a peer-reviewed journal published biannually by the Faculty of Education and Teacher Training, Institut Agama Islam Negeri Pekalongan, Indonesia. It extends the existence of Forum Tarbiyah, the starting journal, which was published by the same faculty. Edukasia Islamika: Jurnal Pendidikan Islam specializes in Islamic education studies, involving character education, Islamic education policy, philosophy of Islamic education, Islamic education management, Islamic education curriculum, innovations in Islamic education, Islamic education leadership, multicultural Islamic education, Islamic education for social transformation, madrasa education, pesantren education, and other relevant topics. The journal promotes researchers, scholars, as well as professionals in the realm of Islamic education to communicate their original research and current issues on the subject. The languages used in this journal are Indonesian and English. Edukasia Islamika: Jurnal Pendidikan Islam is an open access journal which demonstrates that all content is freely available without any charge to the user or his/her institution. Users are allowed to read, download, copy, distribute, print, search, link to the full texts of the published articles, and use them for any other lawful purpose, without requesting for permission from the publisher or the author. This aligns with the BOAI (Budapest Open Access Initiative) principles of open access. Edukasia Islamika: Jurnal Pendidikan Islam has become a CrossRef member since 2017. It indicates that all articles published in this journal possess a unique DOI number.